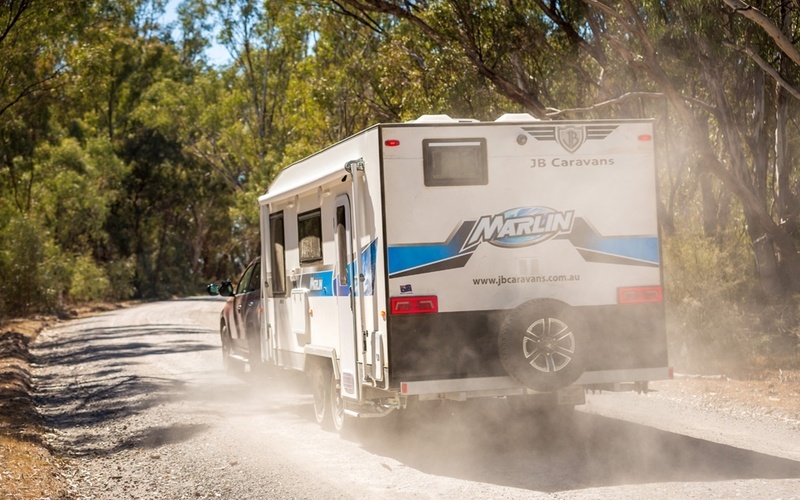 The JB Marlin family bunk van will appeal to first caravan buyers…but you only get what you pay for. This on-roader presents as structurally solid; ready and able to hit the bitumen. Key features in this department are the fibreglass walls, one-piece roof, in-house SupaGal chassis and independent suspension. 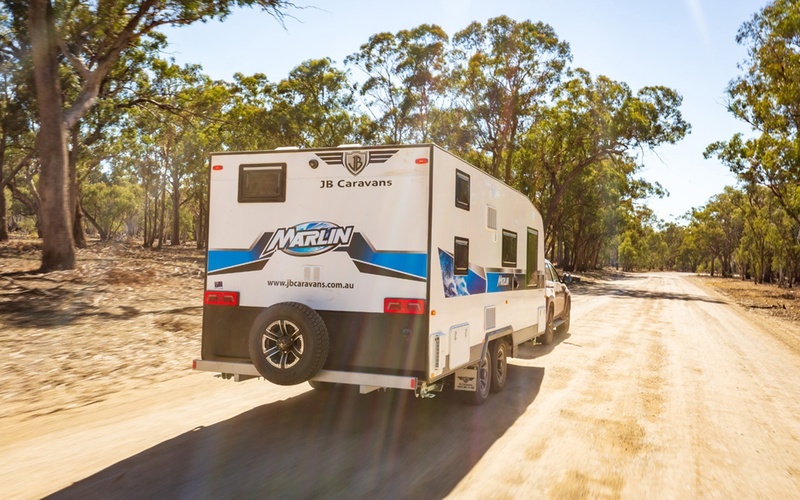 The Marlin doesn’t pretend to be a tough offroad mulga muncher; instead, it runs the very capable AL-KO Enduro Touring Independent Trailing Arm Suspension that’s aimed at touring caravans and camper trailers on bitumen and graded dirt roads. 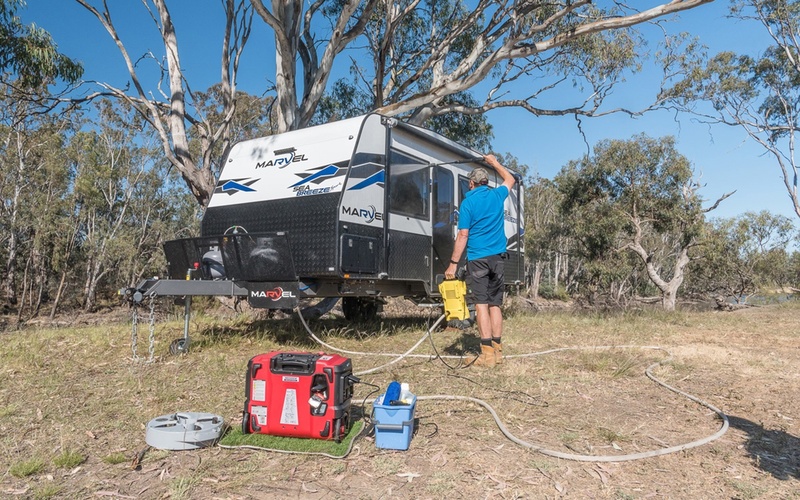 However, on the remote camping front, the Marlin has but one 120Ah battery fitted and only pre-wiring for solar panels. So if going off-grid, you’d need something like an Anderson plug to the tow vehicle. Meanwhile, its rear bunk and bathroom arrangement are a little bit compressed when compared to a north-south bunk/bathroom layout but it’s an interesting way of achieving a slightly shorter van without too much compromise in the overall layout. JB is gone with the ‘less is more’ approach and designed an entry-level family van which would allow any young family to foray into vanning as cheaply as possible. 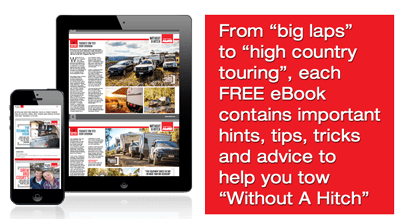 But it’s lacking some fixtures and fittings that have become essential in the modern caravan market – even at this price range. Another area of concern is its towability. There were some harrowing moments in transit as its low ball weight contributed to more ‘swing’ than Tommy Dorsey! To compete in lower price categories is asking for trouble. 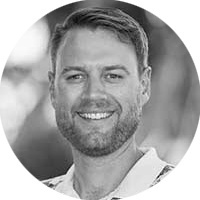 This might be where the most buyers are but it is also where the most vans for sale are and, typically, buyers with the tightest budgets. However, it would be nigh impossible to find a van for less than $60K that matches the Sea Breeze Sport in terms of out-of-the-box styling and structural integrity. It’s a blooming marvel! 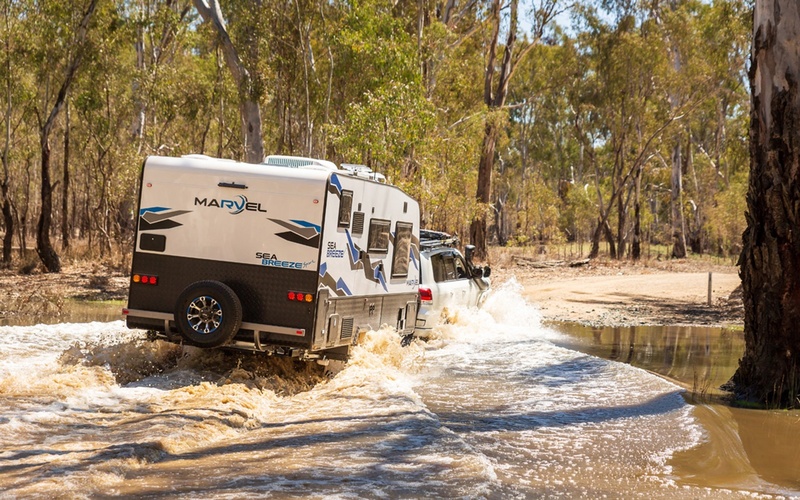 The Marvel Sea Breeze could almost be called a hybrid camper. 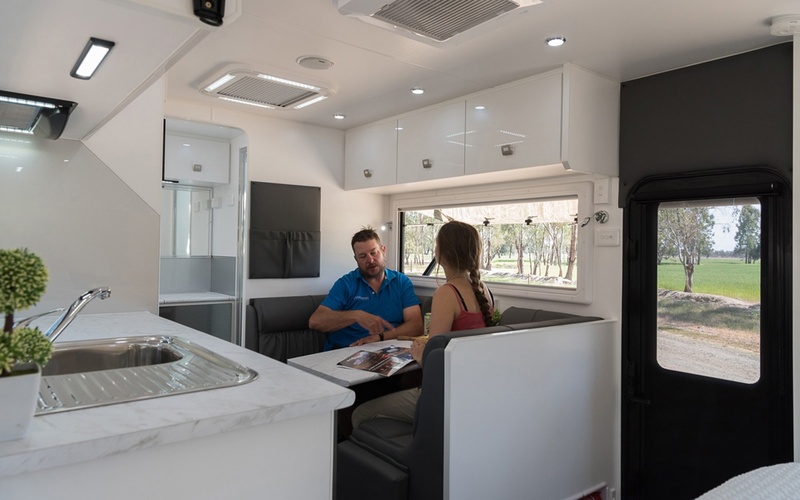 It has genuine offroad construction and abilities while still retaining all comforts of a modern caravan – including an ensuite! The van looks tough as teak armoured in 3mm-thick aluminium composite, with a robust offroad chassis and sturdy offroad suspension to boot. The laminated steel chassis is a 6in A-frame, 4-in chassis and 4in chassis riser configuration. Riding on 16in alloy wheels and AL-KO Enduro Outback suspension, the Sea Breeze has a very good ground clearance. AL-KO’s suspension is certainly well equipped for the offroad lifestyle with coil springs, trailing arms and twin shock absorbers. And it’s an ideal size, whether you intend towing with a large family vehicle, mid-range or large 4WD. The Sea Breeze Sport also boasts a chic interior layout, best described in a couple of words – ‘fashion and function’. 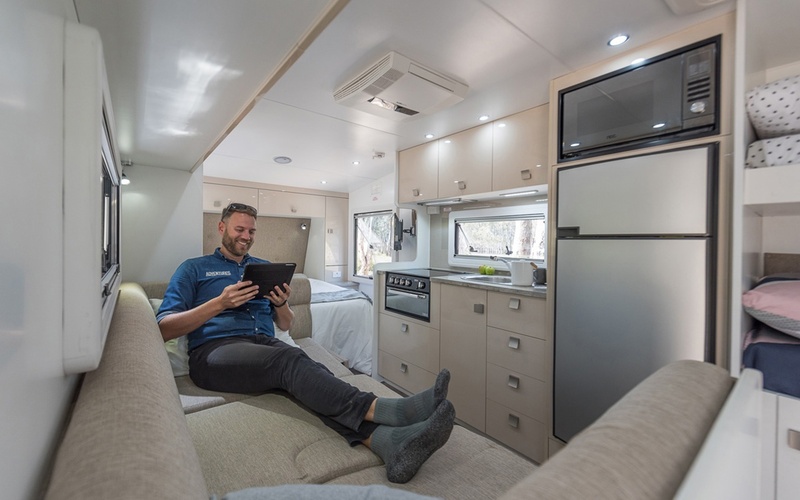 Inside you’ll find the de-rigueur layout that the majority of vans feature – front island bed, cafe-style dinette, full-width rear bathroom. And it’s impressive that so much has been squeezed into this little van, but it isn’t without its compromises. The dinette is a little cramped, and the bed’s unsuitable for taller folk.